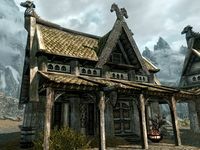 Arcadia's Cauldron is an alchemy shop in Whiterun's market area. It is run by apothecary and Alchemy trainer Arcadia who also lives in the store. If Arcadia is killed, Ahlam will take over. It consists of one area only, Arcadia's Cauldron. Like all other stores, Arcadia's Cauldron has a number of fixed wares on display scattered around the main trading room. These can be bought from the proprietor Arcadia and will disappear from the room when purchased. For a list of these special items, see this section. The main trading room consists of a huge fireplace, an alchemy lab, and a huge desk to the east, where Arcadia stands every day between 8am and 8pm. Without the displayed merchandise, only a few items are left on the desk; namely copies of the books An Explorer's Guide to Skyrim, which adds four map markers for standing stones, and Of Fjori and Holgeir, which details the events of Ansilvund. In the southeastern corner are two food sacks, a few common books, and a cupboard with clutter. Between the cupboard and the alchemy lab is a door leading to Arcadia's private study. On the table sits a bowl with two green apples, a boiled creme treat, and a copy of the Alchemy skill book Herbalist's Guide to Skyrim. The shelves in the southwestern corner hold some common books, along with some sliced goat cheese, a slice of bread, some common books, and a food sack. The room also has a back door leading to Whiterun. The main trading room also has two doors along the western wall. One of them is apprentice locked and leads to a non-respawning chest with some random loot, a food barrel, and two fish barrels. The other door leads to a set of stairs to the upstairs area. 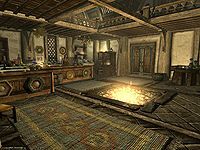 The second floor overlooks the main trading room and is pretty bare-bones, save for two non-respawning wardrobes with clothes and, in the northwestern corner, a table with some bread, a bottle of wine, and a grilled chicken breast, right next to a cooking pot. Underneath the table is a food sack. Along the southern wall is a door to Arcadia's private quarters which consists of a bed, a non-respawning wardrobe with clothes, the Business Ledger, and the strongbox which contains random items. The following items are initially situated around the store. You can purchase them from Arcadia or steal them. They respawn after ten days. Other items may also be present in the store, but are not available for purchase. The Key to Arcadia's Cauldron is carried by Arcadia. This key will only open the front door to the shop, it will not open the back door. If you complete the quest Salt for Arcadia, you can then take all low-level items from this location, due to the quest increasing your disposition with Arcadia. With the Merchant perk of the Speech skill you can place stolen objects into the cupboard in Arcadia's Cauldron and then buy them back from her which clears the stolen flag. If you break into the shop at night, Arcadia might be talking in her sleep. She will say all of her normal phrases but while in her bed and not moving her mouth. The store may be locked during normal business hours and open in the middle of the night, when Arcadia won't do business with you. A successful workaround may be to fast-travel out of the city and return. You may need to fast-travel from many different locations. You may also need to try waiting for long periods of time (potentially many days) in order for the store's hours to reset. Breaking into the shop during normal business hours may serve as a workaround as well, since Arcadia should be inside at work during those hours. This page was last modified on 30 December 2016, at 18:50.